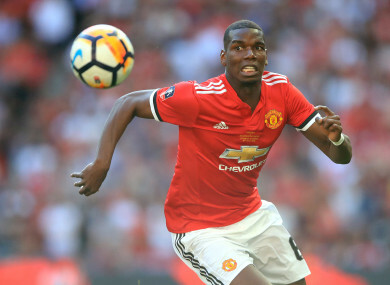 PAUL POGBA HAS refused to rule out a move away from Manchester United, hinting at strains in his relationship with Jose Mourinho after a difficult season at Old Trafford. The £89 million France international has had a tricky second season back at United, being left out of the side or substituted early many times. On other occasions manager Mourinho has publicly questioned his contributions, while transfer talk refuses to die down. Asked by French television station Canal Plus if he would remain a United player, the 25-year-old declined to give a cast-iron commitment. “You can never be sure of anything,” he said. “But contractually, it’s sure, yes. Pogba also discussed his relationship with Mourinho, saying the pair did not have to have the perfect bond to work together professionally. “There were times where I wasn’t playing, I was on the bench,” he said. “There was a lot of talk, people thought it wasn’t working out, but a coach and a player don’t have to be best friends, we don’t have to go to restaurants together. And Pogba said being handed the captain’s armband in certain matches had helped him. Pogba has been linked with a move to hometown club Paris Saint-Germain but said such a move did not hold special appeal. Email “Paul Pogba evasive over Manchester United future”. Feedback on “Paul Pogba evasive over Manchester United future”.